I checked my compost pile this morning and I was disappointed that there was so little activity going on under the tarp. Much of the pile was cold, with small areas of 30 degree warmth. I am doing something wrong and I need to work it out. I will post more about this later. Our pantry holds food which we use on a daily basis. This includes condiments, cereals and any packet of food which we have opened. It also acts as our “public” face… if this pantry held all our preps it would look very unusual to people. Having items in other places in the house means that people don’t know exactly what we have. 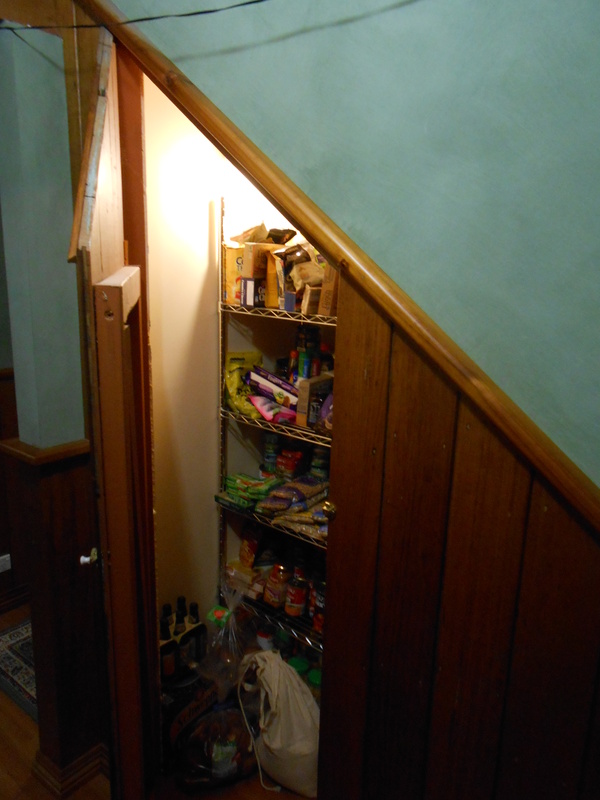 The hallway cupboard, which is close to the kitchen, holds food which we use often, such as soups, additional cereals, cooking supplies (flour and sugar, etc), preserved foods, bottled foods and snacks. The studio holds the bulk items, such as UHT milk, cans of vegetables and other staples. This room also holds our prep items, such as gas cookers, lanterns and torches, batteries and food preserving equipment. We split these up to make room for everything, as well as room for checking purchase dates of items (which we write on every item purchased for storage). We also split them up so that we don’t draw attention to our preparations. When guests visit they see our well stocked pantry and think we are well provisioned – using their own interpretation of this, which means that they believe that the little they see in our pantry is excessive. I recall a conversation I over-heard earlier this year. It was between a father and his young daughter. She asked if they could go get icecream and he answered that they needed to go shopping. When she begged him he pointed out that they had NOTHING in their pantry. I was so shocked to hear this… he made a point of saying verifying that they had an empty pantry. I am pretty happy with our food preps at the moment. We previously estimated that we had around 10-12 weeks of food. Today we worked out that we currently have enough food to feed our 6 member family for around 4 to 5 months. This is more that Jack Spirko recommends in his Survival Podcast as a basic level or preparedness and was something I was aiming to exceeding. I would actually like to have enough food stored for at least 6 months… and we are slowly working towards this goal. We also have no MRE or other portable food stored. This is partly due to the expense of those items, as well as the fact that we are storing food that we use. Later I have plans to put together small ration-packs to be placed in our bug-out bags. Our method for building up our food preps is the copy-canning method. I have used this for building up our preps for the last 6-7 years without knowing that it is called “Copy-canning”. I found a very good explanation of this on a youtube video. This is not only a great way to build up your preps, it is also a method to save money. Rather than buying one extra as RichTheRidgeHunter explains on Youtube, we also stock up with an item we copy-can is on sale. How much food do you keep in your home? How much food do you feel is sufficient? I would be interested in knowing your thoughts on this. Leave your answers or questions in the comments section.